Cow's secret diet strategy: buy whatever junk food she feels like eating. Cookies? Ice Cream? Yes please, into the shopping cart. 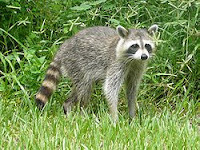 Then, at home, when she's had enough, she immediately puts all the leftovers out for the raccoons. Cow's theory being, it's okay to eat these things once. It's the seconds, and the thirds, that do you in. How is this working, attentive readers may ask? Raccoons looking very plump. Actually, may win prizes for glossiest raccoonage, roundest belly, most ponderous, nay, thunderous, gait. Thus the American diet. And at least they will run it off. Unlike the average human being. We had the same strategy with our dog, then he got a bit roly poly. Now he is forever on a dreary diet of healthy dog food. When I had raccoons they loved it when I put out apples for them.